In Why Knowledge Matters, influential scholar E. D. Hirsch, Jr., addresses critical issues in contemporary education reform and shows how cherished truisms about education and child development have led to unintended and negative consequences. Hirsch, author of The Knowledge Deficit, draws on recent findings in neuroscience and data from France to provide new evidence for the argument that a carefully planned, knowledge-based elementary curriculum is essential to providing the foundations for children's life success and ensuring equal opportunity for students of all backgrounds. In the absence of a clear, common curriculum, Hirsch contends that tests are reduced to measuring skills rather than content, and that students from disadvantaged backgrounds cannot develop the knowledge base to support high achievement. Hirsch advocates for updated policies based on a set of ideas that are consistent with current cognitive science, developmental psychology, and social science. The book focuses on six persistent problems of recent US education: the over-testing of students; the scapegoating of teachers; the fadeout of preschool gains; the narrowing of the curriculum; the continued achievement gap between demographic groups; and the reliance on standards that are not linked to a rigorous curriculum. Hirsch examines evidence from the United States and other nations that a coherent, knowledge-based approach to schooling has improved both achievement and equity wherever it has been instituted, supporting the argument that the most significant education reform and force for equality of opportunity and greater social cohesion is the reform of fundamental educational ideas. 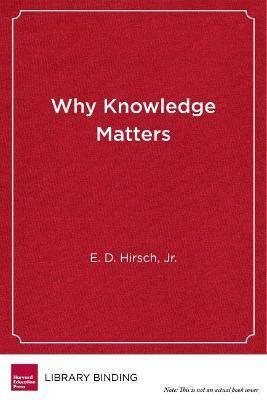 Why Knowledge Matters introduces a new generation of American educators to Hirsch's astute and passionate analysis. Why Knowledge Matters addresses critical issues in contemporary education reform and shows how cherished truisms about education and child development have led to unintended and negative consequences. Drawing on recent findings in neuroscience and data from France, E. D. Hirsch, Jr., provides new evidence for the argument that a carefully planned, knowledge-based elementary curriculum is essential to providing the foundations for children's life success and ensuring equal opportunity for students of all backgrounds. "Knowledge matters! Anyone who has struggled to read an article stuffed with technical or legal jargon, or with arcane references to obscure places and events, has had a taste of what it's like to be a child who has been deprived of the cultural touchstones that literate adults take for granted. Hirsch is performing a brave and invaluable service by reminding us that proficient reading depends not just on skilled eyes and ears but on an educated mind." "Hirsch has done it again. He has produced the most clear and well-grounded argument for why a knowledge-centric education is critical for enhancing educational equity. He pulls no punches. Why Knowledge Matters provides thoughtful solutions to important education issues." "If you are frustrated and angry about the over-testing of students, the narrowing of the curriculum, the scapegoating of teachers, and the persistence of the achievement gap, you must read this brilliant book. Hirsch persuasively explains how all these phenomena are related, and points the way forward to a better education for all." E. D. Hirsch, Jr. is the founder of the Core Knowledge Foundation.